The Holiday Inn Guildford has been awarded No.1 Hotel at the VenueVerdict Awards 2017. BDRC’s VenueVerdict provides the only venue accreditation programme determined entirely by the voice of the customer and based on the meeting experience. The 4* Holiday Inn Guildford is a family-friendly hotel offering a peaceful stay just 30 minutes away from Central London. The hotel’s Academy conference centre provides business guests with excellent facilities, including 15 adaptable meeting rooms for conferences or events. The hotel also offers a Fitness Centre and Spirit Health Club with an indoor pool, and the Junction restaurant serving hearty British cuisine. 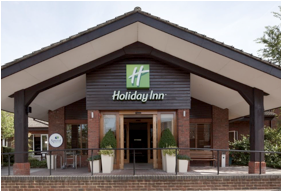 The Holiday Inn Guildford is part of LHMUK who manage a portfolio of 21 midscale and upscale hotels across the country under global brands Holiday Inn and Crowne Plaza.